See what I got in the mail yesterday? 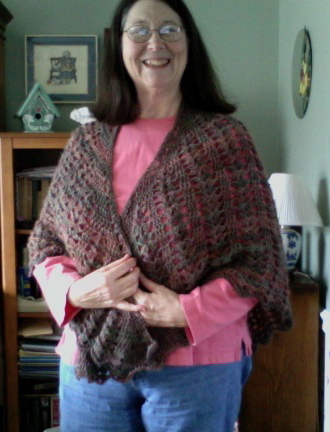 It’s a gorgeous shawl crocheted by my cousin Katy, who lives in California. The yarn is Rowan Tapestry, 70% wool, 30% soybean protein, 131 yds/50g. It has the softness of Merino with the sheen of silk. Yummy. Isn’t the shawl just lovely? I used to crochet a lot, but I don’t anymore because crocheting makes my hands hurt. I mean really hurt. Knitting isn’t a problem, but crochet just kills my hands. So I’m thrilled to have a crocheted shawl to add to my knitted ones. Katy recently lost her husband and finds crocheting to be relaxing and comforting. I feel the same way about knitting. When my dad was in the hospital dying, I did a lot of knitting while sitting at his bedside. Not only did I find it relaxing and comforting, he did too. For some reason, he liked to watch me knit.